Does Heart\'s Alwina costume slay Angel\'s original? 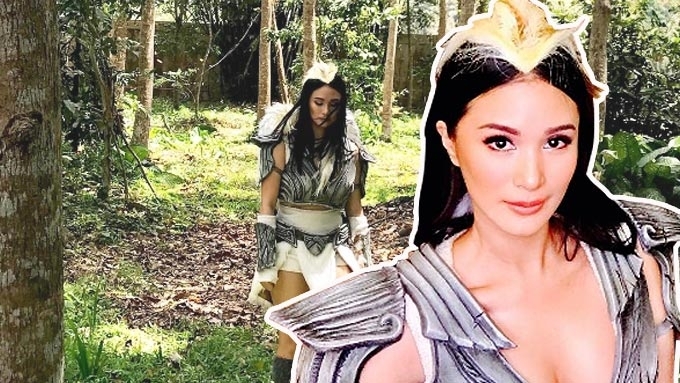 Does Heart Evangelista's Alwina costume slay Angel Locsin's original? Heart Evangelista is the new Alwina in the Mulawin sequel Mulawin vs Ravena. After Encantadia, GMA Network is set to revisit another telefantasya hit—Mulawin. On March 27, its new set of cast, with Heart Evangelista as the new Alwina, was introduced to the Kapuso fans. People were quick to compare Heart to Angel Locsin, the original Alwina, especially upon seeing the former’s costume during the reveal. Remember the combat armor of the then-19-year-old Angel? Along with her iconic wings and tummy-baring midriff, it embodied the character’s prowess as a strong heroine. But don't dismiss the new costume just yet! The reveal of Heart as the new Alwina implied a different phase of the character altogether. She looks a stronger warrior, with her armor looking more solid and metallic. Her wings are less prominent, and her head piece more subtle. The fuzzy wrap on her skirt, however, got some minus points from the netizens. But the overall look stays true to the "astig" character of Alwina. What do you think, PEPsters? Which Alwina has the better costume? Alwina 2004 or Alwina 2017?